The month of May has been linked to the Virgin Mary for hundreds of years, so you will not be too surprised to learn that, on the first of this year’s Bank Holidays, I shall be on pilgrimage at the Shrine of our Lady of Walsingham. I have always had a soft spot for Mary, even though the coveted role of mother of the Christ-Child in the school Nativity play never came the way of a plain and clumsy child with squinting eyes. Perhaps I would have been less eager to take her part, if I had been old enough to reflect on her life in the way that I did when I accepted an unexpected invitation to read the Marian meditation at the Pilgrim Mass during my last visit to Walsingham’s Holy House. It is thought that Mary was quite young when she received her life-changing visit from the Angel Gabriel. ‘Greetings, favoured one!’ Did Mary feel favoured, as a pregnant teenager in a small Galilean village? She must have endured some knowing glances. Mary went off to see her cousin Elizabeth, to be met with the greeting, ‘Blessed are you among women, and blessed is the fruit of your womb.’ I wonder how often she pondered on what it might mean to be blessed, travelling on a donkey in the late stages of pregnancy, giving birth in a stable, escaping into Egypt to get away from Herod. When the baby Jesus was presented in the Temple, as the Jewish religious laws required, the old man Simeon had prophesied that a sword would pierce Mary’s soul. Did she recall his words when, with Joseph, she searched anxiously for the boy Jesus until they found him? Who could have envisaged the anguish that would eventually be hers, as she watched her son suffer and die on the Cross? Her faithfulness and obedience reveal not just a simple peasant girl but a strong and dedicated woman, from whom life as the mother of God would demand all that she had to give. Just imagine her joy, as the news of her Son’s resurrection began to spread. Think too, about how much the first believers must have held Mary in honour, for the part she had played in God’s plan for salvation. Little wonder that Christians of various denominations have continued to accord Mary the greatest reverence and respect and, through the ages, have sought her prayers to support them in their pilgrimage through life. So this May, I shall be journeying once again to meet with other pilgrims in England’s Nazareth and to honour Mary, not for who she is, but for what she does, because Mary always points us beyond herself, to fix our eyes on Jesus. We can all pray that our own commitment to God’s calling will be equally faithful, as we fix our eyes on Him and place our whole trust in His purpose for our lives. The next stage of our work is to apply the Vision Statement locally, to each of the communities which make up our Team Ministry. The aim is to use the different aspects of the Vision Statement to enable the ministry and mission of our individual congregations. On Saturday 26th June we are holding a ‘Team Day’ at St Nicolas’ which will be facilitated by the Revd Andrew Braddock, the Diocesan Missioner. Representatives from each of the PCCs in the Team Ministry have been invited to attend this day and we would like to extend the invitation to anyone from amongst our congregations who would like to join us. The day will run from 10.00am until 4.00pm and include coffee, lunch and tea. The hope is that it will be a stimulating and creative time together which will generate some positive proposals for future working that can be taken back to our various congregations. Thanks to everyone who has given us their comments. These help us to plan services in the future. We also used a new form of the Eucharistic Prayer. Comments about this will be passed on to the Liturgical Commission, who are planning to revise these prayers this Summer. The next Eucharist with a Difference will be on Sunday 23rd May, the feast of Pentecost. Please invite someone you know and offer to come with them, as it can be quite daunting coming to church on your own for the first time. For further information contact Fr Daniel . The Association for Church Editors (ACE), founded just over ten years ago, is a network of self-help groups for editors and others involved in the production and publication of local church and parish magazines and newsletters. I first came across ACE about seven years ago and started attending local meetings, first in Gloucester and then in Cheltenham. We glean ideas on content and presentation from each others’ magazines and discuss ways of improving our publications. ACE holds a conference one year and a competition the next, with occasional workshops in between. Over the years I have made changes to both the content and appearance of our magazine, based on what I have learnt at workshops. Twice I have entered our magazine in the competition, both times receiving either an award or a commendation, and have subsequently made changes based on the judges’ feedback. This year the conference and AGM are being held in St Nicolas’ church on Saturday 15th May, by kind permission of Fr Michael and the churchwardens. Everyone is invited to a service in Gloucester Cathedral on Saturday 15th May which celebrates shared local ministry across the diocese of Gloucester. The service will be presided over by the Bishop of Tewkesbury, and the theme is ‘Centred in Christ’, and will be in the context of a Eucharist. Our own Celebrate! musicians will be providing the music for the Service. Coffee is from 9.15am, and a quiet morning with reflection and prayer led by Bishop John starts at 9.45am. The Service starts at 11.30am and afterwards fellowship and a simple lunch will be provided in the Chapter House. If you would like to participate in all or some of this, would you let me know and then I can give the Cathedral some idea of numbers. On Saturday 10th April I had the privilege of being a guest at a Soirée organised by the Friends of St Mary’s, Prestbury. It was a wonderfully uplifting occasion, featuring music from Bach to Vaughan Williams, and I enjoyed it very much. Michael Freyhan, a talented pianist, who began his career as leader of the National Youth Orchestra, played one of my favourite sonatas, Mozart’s G Major. Having made a poor attempt at this in my youth it was wonderful to hear it played so beautifully. Anne Barton Hodges, soprano, and Paul Barton Hodges, baritone, began their evening with a Bach Duet. It spoke of the love between Bridegroom and Bride, from the Song of Songs. Later they sang early folk songs by Vaughan Williams, part of a collection of English folk songs he had written in collaboration with Holst and Cecil Sharp. Many grandparents present admired the calm demeanour of their two young sons who were part of the audience and appeared to enjoy their parents’ performance as much as we did! The recital ended with Frances Mason playing works by Kreisler. I don’t think I ever enjoyed Kreisler before, but she made her violin sing and it was a joy. During the evening we were served a generous and perfectly splendid supper. The church looked beautiful with the Easter flowers – in fact it was a perfect evening. Thank you to all who worked so hard to organise this memorable occasion. The musical Soirée presented by Friends of St Mary’s on a lovely, and long awaited, spring evening on 10th April was well attended and thoroughly enjoyed. 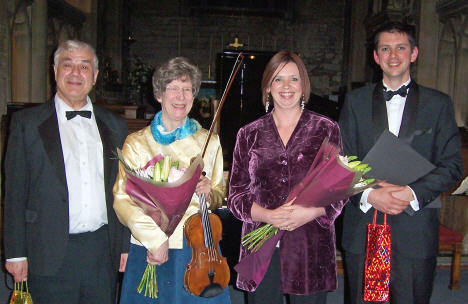 The music, from Bach to Vaughan Williams, was performed by Frances Mason, Michael Freyhan, Anne Barton Hodges and Paul Barton Hodges with both professional skill and enviable talent. Paul’s and Anne’s voices blended well in their duets and were enthusiastically received. Solo performances were equally appreciated with Anne’s pure soprano soaring in the acoustically satisfying loftiness, while Paul’s baritone gave real pleasure. Frances’s violin performances were no less than awe inspiring, while Michael Freyhan’s piano playing must have left those of us who found ‘practising the piano’ too boring for words almost weeping with regret. Supper between performances, cooked and served by Lynda and Ladies, was truly delicious – the result, it is guessed, of several hours of dedicated work. Profiles of the artists and composers written by Fr Paul Iles provided welcome information and added interest. It is hoped that the proceeds from the evening’s event will help towards filling the ever needy coffers of church funds. Congratulations to all concerned. Perhaps more of the same? The next Friends of St Mary’s event is to be a ‘Wine Tasting Evening’ on the 22nd July (postponed from 12th June) in Prestbury Hall. In the darkness of pre-dawn I cycled down to All Saints’, the birdsong almost deafening, and I thought about the women creeping out to Jesus’ tomb. Surely they must have been consoled a little by such singing, even in their deep despair? Every new day is a new beginning, even after such an appalling yesterday. We, a group of women joined later by two children, huddled round as Tim kindled the fire from which Fr David lit the paschal candle. We trooped through the west door into the cavernous darkness of the empty church – a huge tomb? – lighting our little candles from the big one, and continued up the aisle to gather around the nave altar. I first became aware of the windows, large ones high up in the south transept, when they were pale monochrome grey, the designs just discernible. Then slowly, as if by magic, they came alive: first I detected a tinge of red, a little while later a hint of blue. I was fascinated as these reds and blues deepened and became richer, and I had to force myself not to watch continuously, but only to glance at them occasionally. It was about an hour later, after we had renewed our baptismal vows at the font, that all the other colours, greens, yellows and browns, finally became visible. And then suddenly a gem of a window shone out from the Lady Chapel, peeping between the choir pillars, vividly green and red. By the time the service ended at half past seven the sun had risen, the windows were brilliant, and it was a truly alleluia Easter! We breakfasted in the John Wood Room and came out into bright daylight. What a wonderful way to celebrate the Easter Vigil! Chile has, sadly, has been in our thoughts recently as a result of the devastating earthquake. We did wryly note the notice by lifts advising their non-use in the case of earthquake or fire! Chile has separation of state and religion but the Catholic Church enjoys a privileged status, and church attendance is supposed to be around 25%. 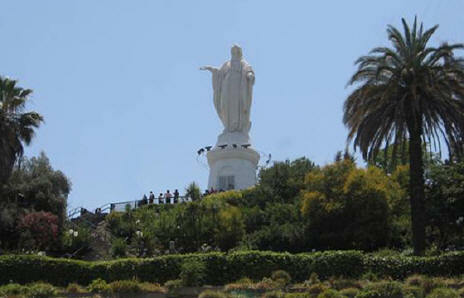 In Santiago there is a huge statue of the Virgin on top of Mount San Cristobal which overlooks the whole city. We ascended this mountain by funicular, and when we walked up the steps towards the statue, rather ponderous religious music issued from loudspeakers. Half way up there was a (covered) open-air altar with a number of terraces looking down at the altar, on which were green wooden seats, acting as pews. However, the main activity we noticed on the Sunday morning we were in Santiago was a huge outdoor keep-fit session in a park, with music broadcast over loudspeakers, and an instructor to ensure no flagging! The last country we visited was Bolivia. Here there is no longer any official religion, but Catholicism is still widely practised. Additionally, we were told in La Paz that some of the most elaborate and famous religious festivals are celebrated to commemorate, for example, the day the country got its independence, so politics and religion can be closely entwined. Here the ancient Aymara people hold on to their traditions and beliefs. Old traditions have lasted over 500 years, for example the Kallawaya (medicine man). Kallawaya people are an itinerant group of healers living in the Andes of Bolivia. They are direct descendants of the Tiwanaku culture and treat by means of plants and potions. This might not be so far removed from homeopathy and our other alternative medicines here, except there is a huge amount of superstition involved in the treatments which does not really tally with Catholic thinking. Mountains are sacred to these people especially when they have snow on them, and the Kallawaya prays to the mountains. The (newish) president of Bolivia, Evo Morales, comes from peasant stock, and he is more willing than his predecessors to encourage this type of thinking where old beliefs have a stronger root in the countryside than in the cities, and apparently these Kallawayas have recently been given the same status as a qualified medical doctor. Tombs in Bolivia frequently have the Christian cross as a symbol, but also a traditional garland of fruits or leaves. Superstition holds sway in other areas too, for example before the foundations of any new building are laid, it is more or less obligatory for a (take a deep breath...) dried aborted foetus of a llama to be placed in the ground. 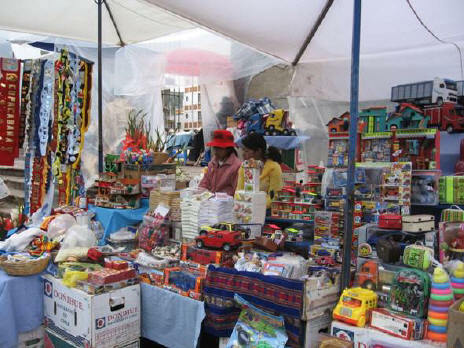 This particular delight can be purchased in the Witches’ market in La Paz. We visited the little town of Copacabana on the shores of Lake Titicaca. Here we were quite bemused to see a whole line of vehicles (cars, lorries etc) waiting outside the main church, bedecked with gladioli and other flowers. Our guide told us that they were waiting for Mass to be over, when the priest would come out and bless all the vehicles, to ensure that they would last a long time and not break down! A member of Prestbury and Pittville Youth (PPY) said, as she left the meeting on 28th March, that it was the best Annual General Meeting she had ever been to. That may not be saying much, as AGMs are notoriously boring, but for PPY the 2010 AGM was certainly a meeting to remember. This was the first time that the PPY meeting was held on a different day from the Parish of Prestbury Annual Meeting. The change was made so that the young people could take a role and they took it with style and energy. Members of all four leisure-time youth groups were present providing live music, video discussions, entertaining games and refreshments. Members of PPY’s two-year alternative curriculum project gave a moving presentation telling of increases in confidence and their ability to talk to others and of working to achieve national qualifications. They were proud of their work as a team, identifying their individual roles, and showing photos of themselves working at All Saints’, St Mary’s and Glenfall House. All the young people were thanked and applauded long and loud. Youth Development Worker, Andy Macauly, introduced all the youth work items and explained his sabbatical leave. Fr David Gardiner, stand-in leader during Andy’s leave, thanked the team of volunteer leaders and young leaders and showed photos of a well-attended adventure and challenge weekend at Viney Hill. Admiration and thanks were also given to Stephen Murton. Admiration for the mammoth task he achieved in cycling from John O’Groats to Lands End and thanks for the £2000+ that he raised for PPY. Photos demonstrated the achievement including of some of the hills he had had to climb. He presented a large cheque to the Chairman. In expressing PPY’s thanks, the Chairman added that more volunteers to help with fundraising and awareness-raising were always welcome and identified some specific jobs that needed doing, including public relations and website management. Then there was a unanimous vote in favour of an important amendment to the charity constitution to enable PPY to work with young people aged 9+ (instead of 11+) and across the whole of the North Cheltenham Team Ministry area. Because of this wider area, it was announced that the charity would operate under the name ‘PPY’ in future. Then came the usual business of an AGM which was handled quickly but efficiently. Hon Treasurer, Gill Wood, presented the 2009 Annual Accounts, thanking all those who had provided personal support for PPY’s work, saying the number had increased considerably. The Annual Report had been circulated with the agenda. Both were adopted unanimously. 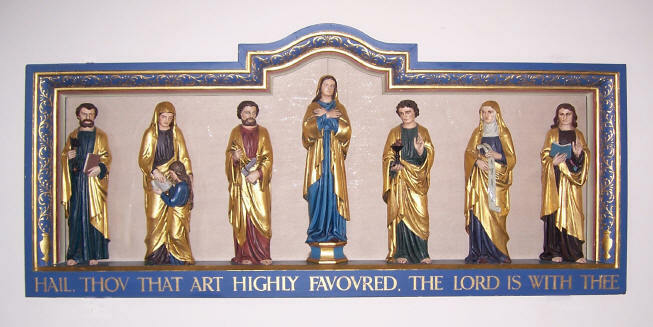 Members of the Executive Committee 2010/11 are: The Revd Michael Cozens as Chairman, Gill Wood as Hon Treasurer, Liz Greenhow as Hon Secretary, Linda Biggs and Clare Wyatt as Parish of Prestbury Appointees and Jill Bradley as an All Saints’ Appointee. Peter Horne and Tricia Wilson were elected for one year. There was one vacancy for an All Saints’ Appointee. Paul Broekman was appointed as Independent Examiner of the Accounts. The Chairman thanked members for their support, prayers and time and urged them to encourage others also to support PPY’s work with young people. ‘I’m a nurse.’ ‘I’m a husband.’ ‘I’m a plane spotter.’ ‘I’m an alcoholic.’ ‘I’m the greatest.’ How do you describe yourself? Do you over-exaggerate a bit and ‘over-egg the cake’? Perhaps you undersell yourself by skimming over your gifts, abilities and attributes. As a Christian I do not believe Jesus was mad, bad or sad but rather I hold that what he said during his earthly ministry was voiced in order for us to get to know his heavenly father more closely and more clearly than had, until that time, been possible for the Israelites – the People of God. Support for this idea can be drawn from John 10:30 where Jesus said ‘I and the Father are one’. Thus it seems that the series of ‘I am’ statements by Jesus in St John’s Gospel are shafts of light helping us to see better the nature and character of both Jesus and his father. In the culture of the time the Good Shepherd guarded the one and only door to the sheepfold. He, Jesus, provides in verse 9 both salvation and sustenance. The former we have celebrated recently in Easter and the latter we will celebrate shortly at Pentecost. True Vine: one Old Testament concept was of Israel as a vine or a vineyard. From Isaiah 5:7 ‘The vineyard of the Lord Almighty is the house of Israel and the men of Judah are the garden of his delight’, and from Psalm 80:8-9 ‘You brought a vine out of Egypt; you drove out the nations and planted it. You cleared the ground for it, and it took root and filled the land’. Jesus, by describing himself as ‘true’, emphasises himself as genuine, not a counterfeit. Furthermore, Jesus is the real vine while Israel is but a reflection of the relationship. The sole purpose of a vine is to produce fruit, to which end pruning is a critical part. But this is not a purely mechanistic process, rather nurture and good husbandry by the gardener – the Father – are essential. Bread of Life: Exodus 16 speaks of the manna and quail provided in the desert for the wandering Jews. Deuteronomy 8:16 tells ‘He gave you manna to eat in the desert, something your fathers had never known, to humble and test you so that in the end it might go well with you’. Jesus in being ‘the bread of life’ provides for our eternal needs, not just our daily food requirements as did the manna. This ties in so closely with our celebration of the Eucharist, and we can understand it as such, though it was an enigma for the people who heard it personally from the Lord. Anyone who wishes to attend the service in Gloucester Cathedral on Sunday 2nd May at 3pm will be very welcome. A coach will run from Prestbury and All Saints’ at a cost between £2.50 and £3.50, depending on numbers. If you are interested in this, please sign the sheet in one of the churches. Five adults from churches across our Team Ministry are currently being prepared for confirmation. Please pray for: Richard Angove, Rachel Cruickshank, Emma Hammond, Elizabeth Heathcott and Julie Latcham, who are being confirmed, and for Anita Claydon, who is participating in the preparation and will be received into the Church of England. The confirmation service will be in Tewkesbury Abbey on Saturday 8th May at 4.30pm. Anyone is very welcome to attend and support the candidates. We are hoping to bring together another production for the Autumn. We are currently meeting at St Nicolas’ on Friday evenings at 7pm. Anyone interested would be most welcome. Christian Aid Week’s house-to-house collection is their main fundraising event. It is both the largest house-to-house collection and the largest single act of Christian witness in the UK with as many as 300,000 collectors raising £10 million. Could you join these collectors if you have not already helped in the past? It need take no more than three hours of your time to collect from about 30 to 40 houses. Collectors must be over 16. If you can help, please get in touch with one of us. We join with our brothers and sisters from the other Christian denominations who worship locally, for a service to celebrate Christian Aid Week. The service this year will be hosted by Prestbury URC – please join us! The Wednesday Morning Bible Study group will be restarting at 9.45am, after Morning Prayer, on Wednesday 12th May at Rosemary Tadman’s house. A Sung Eucharist for Ascension Day. This is a combined service for members of St Nicolas’ and St Mary’s and will be held in St Nicolas’ church. In April we raised £50 for Mission Aviation Fellowship (MAF). It will be the turn of the N-Z team to bake for the next stall on Sunday 16th May. If you would like to be involved with planning Alpha for this coming September, do come along on Tuesday 18th May, 7.30pm at The Vicarage, Tatchley Lane, Prestbury GL52 3DQ. Our next meeting is on Tuesday 25th May at 7.30pm at St Nicolas’ Church. Our speaker will be Father John Mead and his topic is ‘Stanley’s Heaven’. Everyone is most welcome and can be assured of a good evening. The outing to Litchfield in July is now fully booked. A service of thanksgiving for the gift of Holy Communion (traditionally known as Corpus Christi) will take place at St Mary’s at 7.30pm on Thursday 3rd June. This will be a sung Eucharist with procession of the Blessed Sacrament and Benediction. All are welcome. Once again the ladies who so generously make up the Mothering Sunday posies excelled themselves. The flowers were a pure delight, and so simply and beautifully arranged. When I came into the church on the Sunday morning to move them I was met with such a wave of perfume as only fresh Spring flowers pour out, and the profusion of gentle colours round the font was such a lovely contrast to the bareness of the Lenten church. Very, very, many thanks for your continual help. What wonderful weather to work in the churchyard! Very many thanks to those who came along on 10th April and worked so hard. It was great to see Celebrate! young people joining in. As usual we had hot sausage rolls, coffee and squash at about 11am, which gave us all a short time to chat with each other. The churchyard looks really smart now. Also very many thanks to those who turned up for the cleaning of the church on 20th March and to Stephen Murton for doing all the high cobwebs for us. Thank you to everyone who supported the ‘All Saints’ All STs quiz’. The winner was Barbara Lyle and the children’s prize was won by Abi – one of our Tuesday cubs. Many thanks also to my mother, who devised the quiz for us!